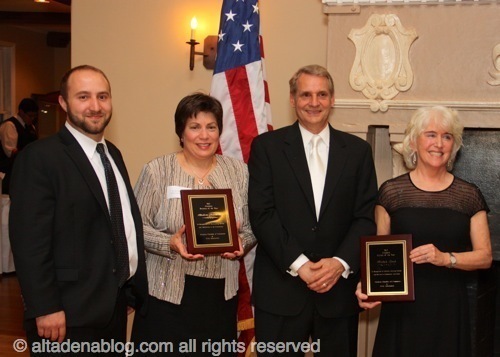 Jimmy, Paula, and Jim Orlandini of Altadena Hardware (Business of the Year) shared honors with Citizen of the Year Michele Zack at the Altadena Chamber's annual dinner in Feb., 2013. 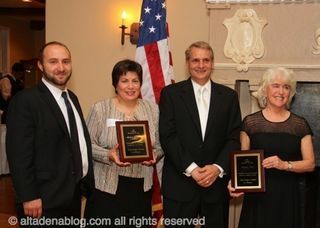 The Altadena Chamber of Commerce is now taking nominations for Business and Citizen of the Year. The Chamber annually honors an outstanding local resident and a business or other organization at the installation of new officers in January. Citizen of the Year and Business of the Year can be nominated by anyone. Winners are chosen by a committee consisting of representatives of the Chamber, Altadena Heritage, Altadena Historical Society, Foothills Conservancy, Altadena branch of the NAACP, the Altadena Sheriff Support Group and Altadena Town Council, as well as past Citizens of the Year. Must be a resident of Altadena. Has contributed substantially to the betterment of the community through the years and been involved in the community through volunteer efforts. Individuals who are employed in a public service position in Altadena (i.e. Clergy, Law Enforcement, Public Relations, Politics, etc) must demonstrate community involvement above and beyond the scope of their paid position. 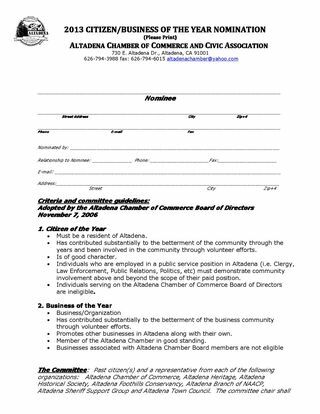 Individuals serving on the Altadena Chamber of Commerce Board of Directors are ineligible. Has contributed substantially to the betterment of the business community through volunteer efforts. Promotes other businesses in Altadena along with their own. Member of the Altadena Chamber in good standing. Nominating forms are after the jump (pdf copy is here) and should be received by the Altadena Chamber of Commerce no later than Nov. 30 via mail, email (cmersola@aol.com) or fax: 626 798-0387.